The Wild Cow Nashville vegetarian restaurant opened in 2009, and I've been going and trying their food ever since. I think I've had just about everything on the menu, and I've been impressed at how consistently their food has improved over the years. Every day (except Tuesdays, when they're closed), they have specials, and a few of those have been so outstanding I've requested they become mainstays on the menu. The regular Wild Cow Nashville menu is dominated by sandwiches and salads. They make a mock chicken salad sandwich that is delicious and interesting, with tiny pieces of seitan and a nice crunch from red grapes. We've also had their Philadelphia cheese steak sandwich, which I find to be a bit small and less filling, but it does taste good. 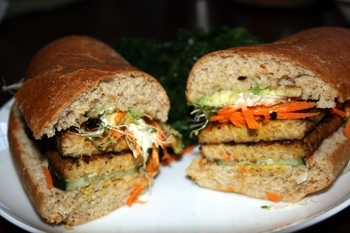 My husband loves the Buffalo Grinder, with its spicy hot sauce and perfectly cooked tempeh. 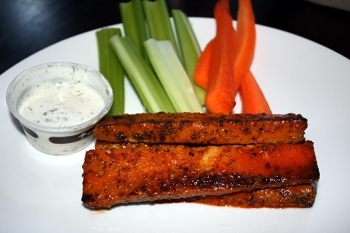 It can be made with tofu or tempeh, and whichever one you choose is grilled and covered with an awesome spicy barbecue sauce. It comes with a side of ranch dressing. Wild Cow also makes the buffalo grinder into a salad and an buffalo tempeh appetizer, which is one of our favorite options. They have another tempeh sandwich with fresh veggies called The Prince Fielder. The Prince Fielder is fresh and has great texture. They also just added a French Dip style seitan sandwich with an au jus dipping sauce that was right on the money. I thoroughly enjoyed the Green Chile Root Salad with its special caesar dressing and a really perfectly grilled tofu. All of their tofu and tempeh products are organic, of course. Both salads were filling and delicious. They have a few different taco options, and we like the fajita version quite a bit. It's made with soft seitan and is covered in beans, rice, avocado, and vegan sour cream and cheese. The only thing we could have asked for differently here would have been bigger tortillas. There was absolutely no way to pick the small ones up and keep any of the food inside them. 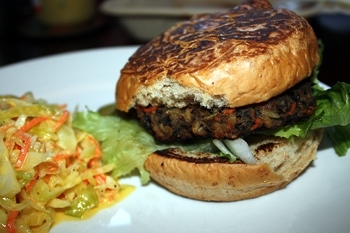 I tend to stay away from veggie burgers when I eat at vegetarian restaurants, probably because it tends to be the one option available at non-vegetarian places, so I feel like I can do better. If you're at Wild Cow Nashville, I recommend trying their veggie burger. The burger itself is flavorful and intense, and you can add several different types of sauces on top to mix up the style of burger. With all the sandwiches, you can substitute in sides instead of chips, such as grilled marinated mushrooms, pineapple coleslaw, and mac-and-cheese. Their spicy kale is awesome and their dipping sauces are really good too. You can also trade out different kinds of bread on the sandwiches, although on more than one occasion that request has been forgotten. They do have some items that are prepared and stored in a handy fridge for take-and-go meals. Other options include a side salad, a pasta salad, hummus, mashed potatoes, and raw desserts. In the past few years, we've tried several of their desserts and have been impressed overall. One of our favorites was an almond joy cake with chocolate cake and almond/coconut shreds throughout the cake and frosting. They have a really nice lavender cupcake that is light and floral and beautifully decorated. My husband saw this cookie right before dinner and I knew he had pinpointed it for dessert. 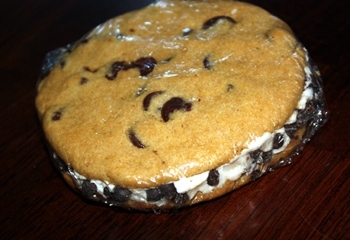 When we got to dessert, he asked for the "chipwich." The server had no idea what he was talking about. C'mon... no one makes chipwiches anymore?? It was good, but way too rich for me. The filling is vanilla cake frosting and it's rolled in tiny chocolate chips. He loved his chipwich. 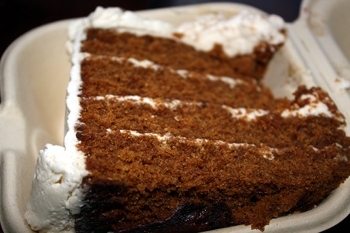 This fragrant gingerbread cake with cinnamon frosting was much more up my alley. 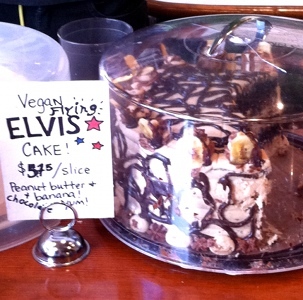 The Vegan Flying Elvis Cake combines peanut butter, banana, and chocolate in a decadent, over-the-top celebration of all things dessert. It's my sister's favorite flavors all mixed into one. Wild Cow also has some raw desserts like cheesecakes and truffles, as well as non-raw treats like cookies. And, they serve beer, wine, cider, and sake. The most important thing is that the food is good and every time we've been to Wild Cow Nashville since it opened, it has been packed. I am so excited to see that a fully vegetarian restaurant can thrive in Nashville. The last time we went it was so busy that we asked about them opening a second location and the server said they knew they needed another one. Thanks so much Wild Cow Vegetarian Restaurant Nashville!